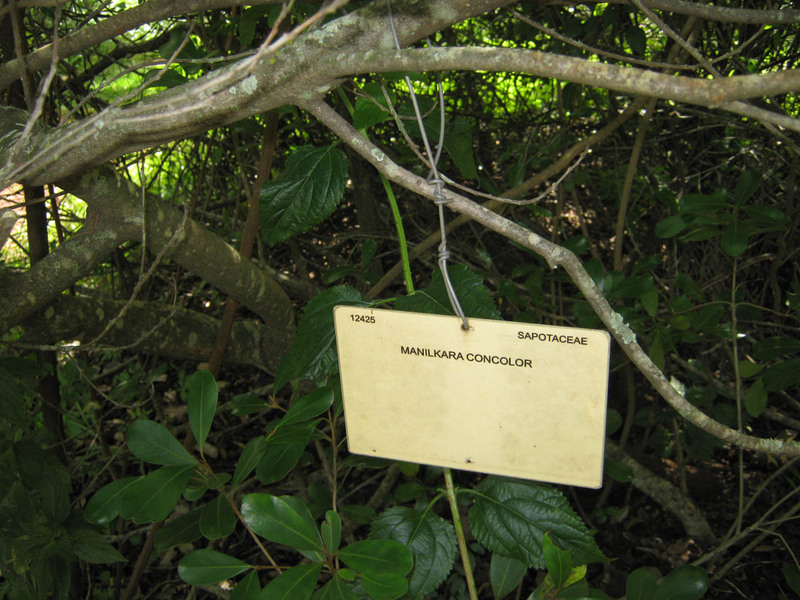 The tree label above is from a private tree labeling exercise undertaken at Hippo Pools Wilderness Camp located in Umfurudzi on the Mazowe River. The Tree Society members have been helping the National Botanical Garden staff to label their trees – these labels were given by the Diplomatic Spouses Association in Harare. They have also been helping the staff at Ewanrigg Botanic Gardens to name trees there, but without a planting plan it has been more difficult, especially finding names for the exotic trees. In addition, trees in other locations have also been labelled. They have learnt that because of continuing tree name changes (which keeps the taxonomists employed), the easiest way of labelling a tree / bush is to attach a number to it and then provide a list with the correct names against each number. On the list, all the details pertaining to that number can be shown and as names change so the list is amended accordingly. They have also learnt that even large trees grow and expand their girth quite considerably so that annual maintenance is required to cater for this expansion. They therefore start by nailing a label onto a tree but not hitting the nail all the way down until it reaches the bark, so that about 15cm of nail is left still sticking out. After every season of growth, nails are pulled out enough to provide more growing space. On trees / bushes that have stems / branches that are too thin to take a nail, a label is secured loosely onto a suitable branch with wire or is placed on a peg. The tree list, which can be bought from the gate / reception of each of the sites, has such details as: number of tree, botanical name, common English and African names, family, etc. as well as the GPS co-ordinates of a good specimen of the tree in that particular garden. At the back of the listing, there is an index with all the names on the list but with many more common names, old botanical names etc. If anyone wants to know whether or not a certain tree exists on that site, all they have to do is look it up in the index. 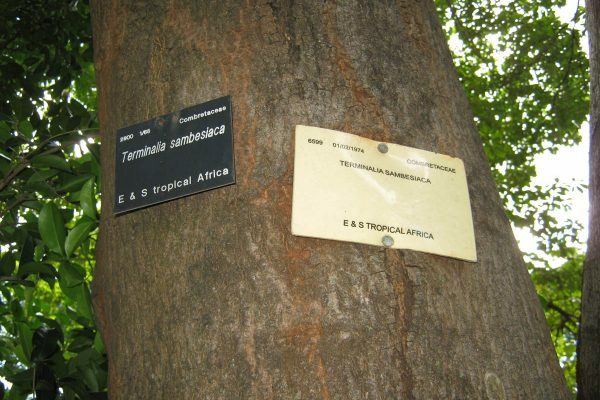 The Mukuvisi Woodlands has had its trees labelled several times (that is within the Interpretive Area outside the game fence) but somehow the labels have not lasted for whatever reason – some remnants of the old labelling systems can still be seen. 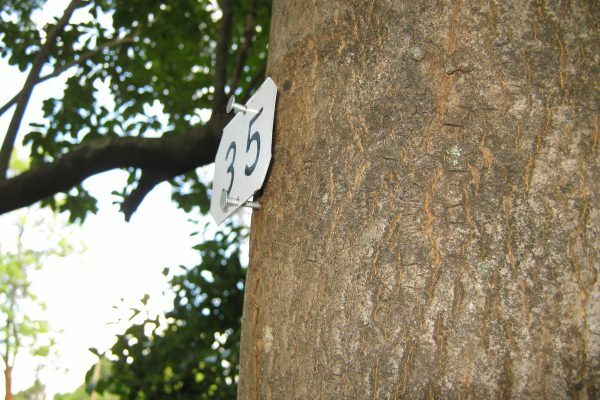 A few years ago, it was decided to label the trees again, not with a label as such but by using a number that was painted onto the bark of the tree, which would prevent theft. A pamphlet was printed which contained information on the numbered trees, such as Botanical names, old Botanical names, common English as well as common African names, an index etc. – it even included the uses of these trees! The problem with this system is that some trees shed their outer bark and therefore lose the painted numbers. Also, as the tree grows the girth increases and expansion cracks distort the number. Today, most of these numbers are still in existence but have been complemented by discs that have the information painted on them. 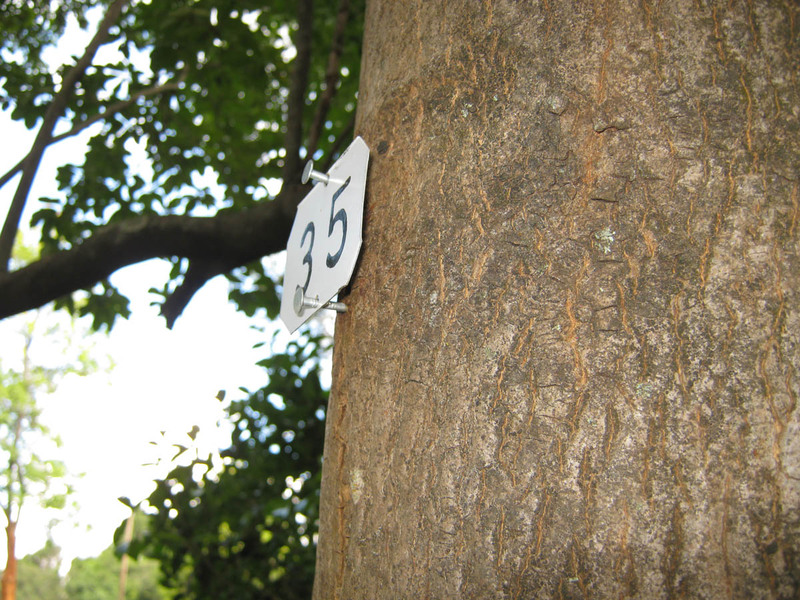 Recently another exercise was completed using numbers painted on Chromadek discs which were secured to the trees. It was amazing to note just how many trees have been lost in the last five years! Presently there are 142 numbered trees, some of them being exotic species. If you want to see Acacias, Mukuvisi Woodlands is a good place to start as there are more than a dozen different species there. 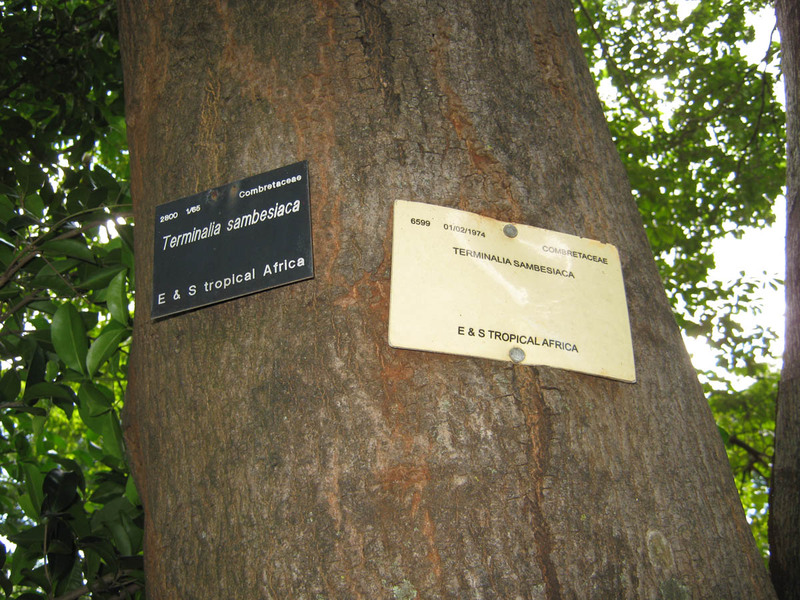 The trees in Haka Game Park were first labelled in and around the ten picnic sites. After that, labelling of the trees along the main roads was done and thereafter the exercise came to an end as it was difficult to know which of the smaller roads was which. A detailed map is required before the exercise can continue. There are about 70 species of trees identified so far, with just a few of them being exotic trees. Numbered discs were nailed to the trees or attached with wire, while GPS readings were taken for the trees at the picnic sites and for the roadside groupings of trees. Just over 200 trees / bushes in Ewanrigg Botanical Gardens have been identified so far. 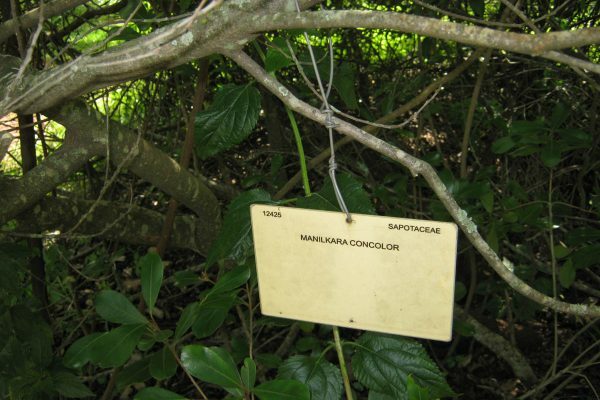 The indigenous trees have all been labelled but there are many unknown exotic trees that still need to be identified. The list is now available at the entrance gate. Labeling is currently underway in the National Botanical Gardens and the first Tree List of 300 species should now be available at the entrance to the car park. This list has been sent to all Tree Society of Zimbabwe members. An additional 100+ trees have been labelled, however there are quite a few unknown trees in this range. As more trees are identified, new listings will become available. There are many exotic trees in this location. The first tree labelling at Lasting Impressions, a site just beyond Kadoma near Claw Dam, was done in October 2017. Further labelling took place by Mark Hyde and Tony Alegria in May 2018. A total of 102 trees have been identified so far and the list is unlikely to grow much more. Trees were identified in the “Camp” – were the “A” frame dormitories, ablution blocks and a large thatched all purpose function building are located on top of a hill. Trees were also identified on the top of a hill and sides along its access road – this hill represents the highest point on the property and is called “Mount Everest”. Trees were also identified along the roads from the entrance gate to the “Camp” and all the way to the base of “Mount Everest”. The lists now need to be completed with the biggish issue being the vernacular names. There are many “tongues” in Zimbabwe and hence many names for the same tree and sometimes there is a name that covers many trees!